We did 2 activities for the price of 1 today. The morning made us finally tackling something which has been a problem for some time which we have gone through great efforts to try and address:dog poo. Since the ban on dog walking on playing fields and sports grounds, we have had ever increasing foot and paw fall on the LNR. This coincided with our improved access of the Tidy Towns 2013 project. Local Nature Reserves are for wildlife and people and are incredibly important for... mental and physical wellbeing. So the LNR is a great and well used resource. However, there has also been a huge increase in dog poo not picked up and dog poo picked up and thrown in bushes or trees. Both are big problems, we volunteer in these bushes and we take every year group out onto the LNR from Henllys CIW School. On a recent bulb planting session with year 2, we checked the ground beforehand, but an unsupervised dog had a poo on the ground and one of the children put his hand in it. Luckily he was wearing our gloves. Dog poo on a child's glove. Dog owners, please bag it and bin it! We've put Torfaen Green Dog Walkers signs up at all the principal entrances and this has made a big difference. We do want to make it so easy that there aren't any excuses. 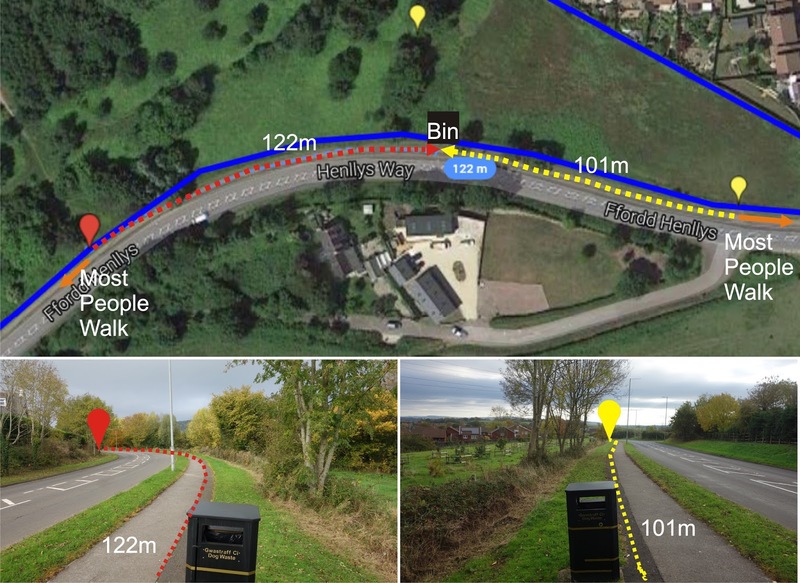 We looked at the Henllys Way entrances and Brian said "people walking home from any of these exits have to walk 100m in the opposite way to use the bin. Why don't we move the bin to the orchard entrance where most people walk? People will be more inclined to pick up and then bin it." Well, we asked Streetscene for permission to do this with the explanation and eventually this was granted. Materials were provided by TCBC's Ranger Jon Howells and with support from his long-standing volunteer John Adkins, we moved it and installed it right by the gate. The first 2 people we saw said well done for moving the bin and common sense won. To be fair, the bin was there before the access improvements of 2013, but common sense has won as has partnership between our volunteering group and the TCBC.